In a world as vast as Star Trek, a world that spans 6 television series,13 films and thousands of books, the argument of what is canon is one that comes up often. Although not considered canon, Star Trek comics have been and are still very popular even today. 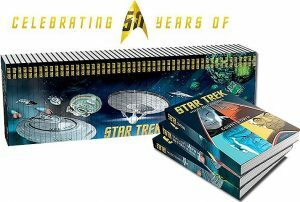 Eaglemoss Collections has combined the archive of all the Star Trek comics, starting from its first Gold Key run up through their current IDW publisher, into a unique graphic novel collection. Each month since starting my subscription, two hard-bound graphic novels have arrived. 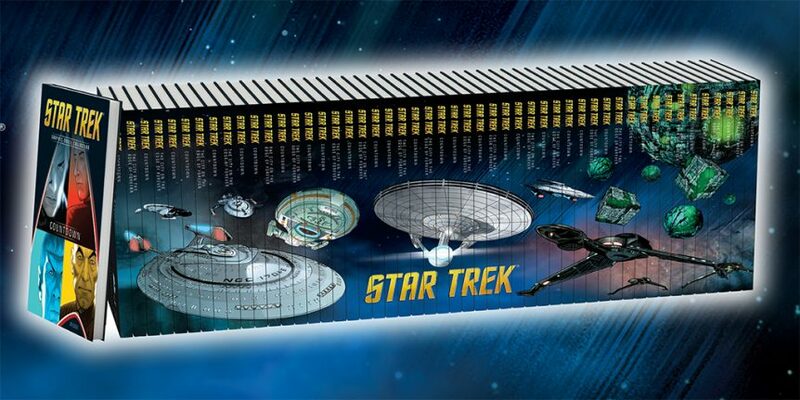 Each contains a main Star Trek story that may have spanned several issues and have been gathered into one contentious novel. Each volume also contains an original Gold Key Classic TOS story. future from becoming a reality. I was really excited when this novel arrived. I had seen this particular novel before at a well-named bookstore and had always wanted to bring it home and read it from cover to cover but could not have afforded to at the time. The story was written by Brannon Braga, a legendary writer for Star Trek as well as executive producer on several of the Trek series. The artwork is amazing; it engulfs you into the story as it spins back and forth through two time periods. So far this is one of my favorites from this collection, although I have just begun to start collecting. I invite any fan who is looking to expand their Trek knowledge in Trek lore to take a look at the expanded universe that is the world of the Star Trek comics.